FOURTH IN THE MARTIN BORA SERIES. 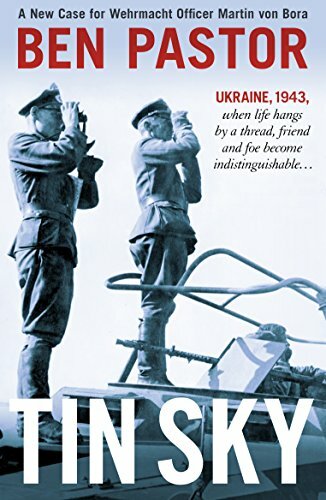 SPELLBINDING MULTI-LAYERED CRIME NOVEL SET IN UKRAINE AS THE GERMANS REGROUP AFTER THE DISASTER OF STALINGRAD. FOR FANS OF PHILLIP KERR (BERNIE GUNTHER SERIES), ALAN FURST (SPIES OF THE BALKANS). THE HERO, MAJOR MARTIN BORA, IS AN ARISTOCRATIC GERMAN OFFICER OF THE ILK OF CLAUS VON STAUFFENBERG, TORN BETWEEN HIS DUTY AS AN OFFICER AND HIS INTEGRITY AS A HUMAN BEING. Ukraine, 1943. Having barely escaped the inferno of Stalingrad, Major Martin Bora is serving on the Russian front as a German counterintelligence officer. Weariness, disillusionment, and battle fatigue are a soldier’s daily fare, yet Bora seems to be one of the few whose sanity is not marred by the horrors of war. As the Wehrmacht prepare for the Kursk counter-offensive, a Russian general defects aboard a T-34, the most advanced tank of the war. Soon he and another general, this one previously captured, are found dead in their cells. Everything appears to exclude the likelihood of foul play, but Bora begins an investigation, in a stubborn attempt to solve a mystery that will come much too close to home.